Bedroom Drapes Offer Privacy - Sew What? Sew Anything! Downsizing to a smaller home doesn’t mean that style has to go out the window. These beautiful bedroom drapes are a perfect example of style, function and economy for this condominium bedroom window treatment. We recently received a call for help from a client after they had moved from their large home to their smaller condo. Adjusting to condo life meant needing to think about window treatments for privacy. This had not been a concern in their former home. These drapes gave needed privacy to a master bedroom in the condo. Working with some existing bedding, we were able to create these drapes to coordinate with the bedding that the homeowner had recently purchased. This move saved some money and created a beautiful look for their new bedroom. 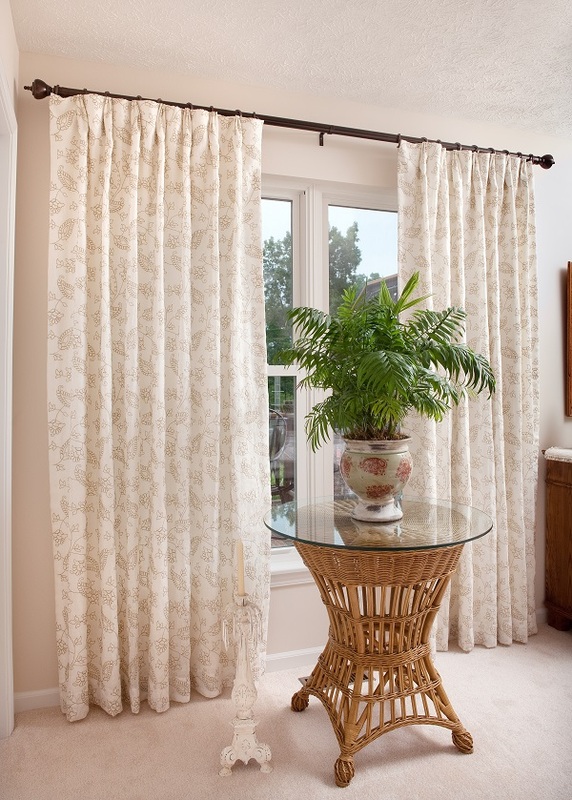 I love using this great curtain rod and fabric from a Canadian supplier J. Ennis. This is fabic that you can’t find anywhere it is beautifully embrodered. My client loved the look and was so happy to have the elegant look for their master bedroom.